In the spring of 1984, Rev. and Mrs. Wray Stone were led by the Lord to the city of Kitchener. There they began laying the foundation for a New Testament, Bible preaching Church. The first service of Kitchener Baptist Church was on Sunday morning July 1, 1984, and was located at the Westmount Public School. At that first service there were 13 in attendance. The Church then moved to Forest Hill Public School until May, 1985. On May 23, 1985, while meeting at the Lion’s Arena Hall, the Charter Meeting of Kitchener Baptist Church was held. There were 17 people that signed the charter. In 1990 the church purchased a building on Hoffman street, and in 1994 Pastor Wray Stone retired. 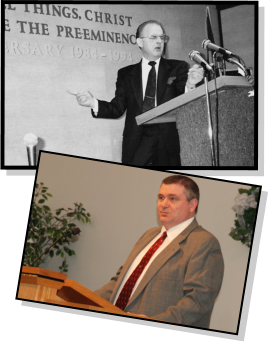 In 1994 Pastor Harry Strachan, Jr. accepted the Lord’s leading as Pastor and Pastored for one year. In December of 1995 Rev. Philip Clayton accepted the Lord’s leading as Pastor. In 1997 the church purchased land and a building on Victoria Street North. In 2005 the church sold the building on Victoria Street and built a new building on Glasgow Street. This is where the church remains today (1720 Glasgow Street, Kitchener, Ontario). In 2011, Pastor Clayton resigned as the Pastor of Kitchener Baptist Church, and followed the leading of the Lord to be an evangelist. Shortly after, Pastor Jerry A. Burns accepted the leading of the Lord to be the Pastor of Kitchener Baptist. Pastor Jerry Burns was the assistant to Philip Clayton for almost five years.